Where do I start with this book? All my thoughts are clamoring to be discussed and I can't seem to pick just one. Everything about this book was beautiful. Every. Single. Part. Even the dark and horrific points were tinged with hope, with conviction. 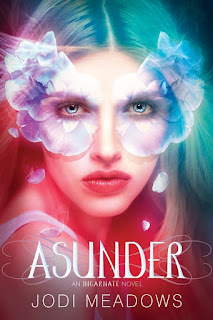 Jodi Meadows is a pure talent, and Asunder was more than I could have ever expected. I would love to study this book. To dissect the characters, explore the themes, and talk about the prose. The English major in me is just itching to dive deeper into this story. There is just simply so much depth to Asunder and I can't get enough of it. I want to read it again and again just so I can soak it all up. In Incarnate we saw the image of a butterfly being used to tie the story together. In Asunder roses were a central theme and by gosh, was it done well. It added an extra layer to the story and Ana's character. The fleeting life of a rose, its undeniably beauty, and its fierce will to live describe Ana and her situation perfectly. She doesn't want to just be a blip on the map. She wants to make a difference. She wants to break past the barriers set before her. As I said in my original review of Incarnate, the cruelty that marred this beautiful world is striking. These apparent "pure souls" are sullied by their hatred and bigotry. And in Asunder, this is taken to an entirely new level. I was horrified by what the People of Heart did, both to these New Souls and to the people they considered "friends". It was painful to read about and made me beyond livid. There was so much injustice and lies that I wanted to shake the book and those awful characters in it. But, while there was so much darkness there was also many moments that had my heart soaring. Now, let me gush about Sam and Ana. Individually, they are two moving characters with so much heart and strength. The musical Sam makes my heart melt because he is just such a good and loving guy. I loved his passion and dedication, his kind heart and his never ending love. He's the kind of guy I wish I knew simply because he would bring such joy to my life. And the protagonist Ana is such as kind and beautiful as her love. She is such a strong, passionate person dealing with many difficult obstacles. Ana is dealing with past and present abuse. She was raised by a cruel and vicious woman who told her time and again that she was less than a person. And now, Ana has to face the same hatred, mental and physical abuse at the hands of a community. Asunder really addresses the painful and damaging affects of that abuse, and how it alters her relationship with Sam. And that, despite all the hatred, Ana sends back out love. Together, her and Sam are such a realistic couple. They clearing care for each other, but they're both human. They make mistakes. They're scared. But, despite everything, they work together to create a strong relationship. I love how Jodi Meadows weaves music into the story. I felt like I can hear Dossam on the piano and Ana on her flute. The music just wraps around me, and gave me this inherent feeling for hope. Music plays such an important and powerful role in the story, and I could totally relate to that. It made me want to run out and listen to my favorite songs and just revel in the magic of them. Asunder sees a lot of plot progression as well. Lots of questions were answered, and lots of craziness ensued. Putting this book down was not an option. I was so entranced by the characters and the need to know exactly what was going to happen next! I was blind-sided by some of the twist and turns, and my heart swelled with pride every time the characters faced these challenges with determination. Asunder was one of the best sequels I have ever read. I was completely blown away. Jodi Meadows knows how to write, how to create a gorgeous and original story, and how to create characters that will become a part of you. Asunder, you were no fleeting rose. Your beauty will remain with me for years and years to come.